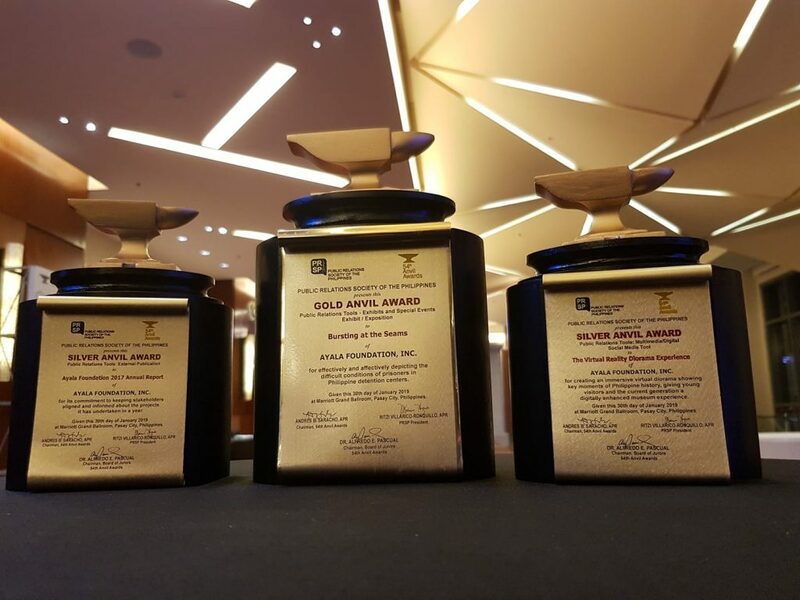 Ayala Foundation emerged as one of the big winners at the 54th Anvil Awards, winning four trophies in total. The awarding ceremonies were held at the Marriott Grand Ballroom on January 30. The foundation received the Gold Anvil for the internationally acclaimed exhibit “Bursting at the Seams: Philippine Detention Centers,” which features compelling photographs by Rick Rocamora. The exhibit was staged by the Filipinas Heritage Library and the Ayala Museum. The highly popular virtual reality videos of the Ayala Museum’s Dioramas of Philippine History, meanwhile, won Silver Anvil Awards in two categories—one for PR Tools and another for PR Programs. The VR Dioramas, which was launched in 2017 with the video on the execution of Dr. Jose Rizal, presents key moments in Philippine History in an immersive manner. In 2018, the museum premiered VR videos on Andres Bonifacio and Emilio Aguinaldo. For the second year in a row, the Ayala Foundation Annual Report won Silver Anvil Award. Titled “To Reach New Heights,” the annual report featured the reach and impact of the foundation’s programs in reporting year 2017. The report was written and produced by Ayala Foundation’s Corporate Communications Division. The Anvil Awards are presented annually by the Public Relations Society of the Philippines.